JVC is a video camera company with many years of professional camcorder heritage - and they make great cameras - but that doesn't seem to get them much respect. The big buzz in high end prosumer camcorders last year was the Ultra High Definition "4K" Sony FDR-AX100, which lists for $1698 (on sale right now for $1598). But few reviewers (or camcorder buyers) seem to be aware than JVC offers a professional UHD camcorder at about the same price, the $1795 JVC GY-HM170 (on sale right now with a free XLR adapter and top handle) . Case in point: there was a big update/review of the Sony AX100 at Cinema 5D recently - in part because Sony recently updated the camera with 100mbps Ultra HD. Lost in the excitement over the AX100 upgrade, however, is the fact that the HM170 has been recording UHD at 150mbps since its release last fall. Sony has also recently released an XLR adapter for the AX100. The $598 Sony XLR K2M adapter mounts on the AX100's non-standard hot shoe. This addition gives the AX100 XLR mic inputs - but appears to make the camera a little top heavy and awkward. There's still no top handle. The HM170's $399 XLR adapter, on the other hand, is built into a standard pro camcorder top handle. With the top handle mounted, the HM170 looks like its big brother, the HM200. In fact, they become identical cameras, with the exception of the HM200's live streaming feature. The pro HM170 has other standard features the prosumer AX100 lacks - such as HD 4:2:2 color subsampling, dual SD card slots and manual control of color (e.g., color gain, gamma, master pedestal). 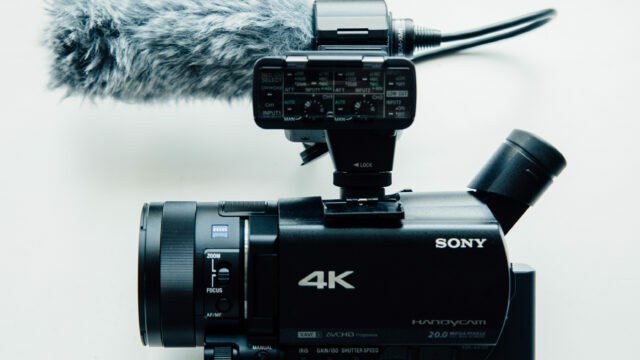 At $1795, the HM170 is only a couple of hundred more than the AX100 - but, as of this post, it is the only professional 4K camcorder you can buy right now for less than $2000 (the $1999 Sony PXW-X70 doesn't count because you have to pay another few hundred to upgrade it to 4K). To be fair, the HM170 is a traditional 1/2.3" sensor camcorder and the AX100 (and the X70) sport the larger 1" sensor. If you need a 1" sensor, the HM170 is not the camera for you. 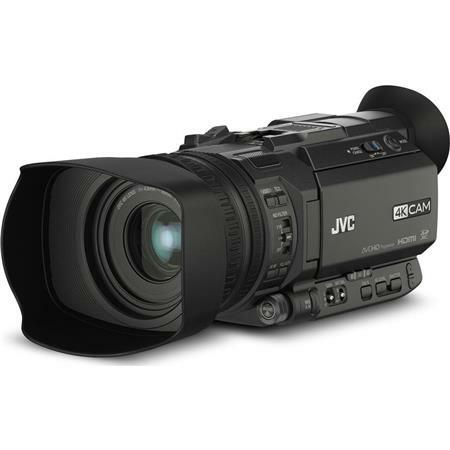 That said, if your budget is less than $2000 and you want a 4K camcorder with manual color control, XLR inputs and dual card slots, the $1795 JVC GY-HM170 deal with the free XLR adapter/top handle is pretty much the only game in town. I have shot with the HM170's large sensor 4K stable-mate, the JVC GY-LS300, and the latest generation of JVC camcorders are the real deal. Great image quality, good low light performance, pro ergonomics and reasonable prices. They ought to be selling a whole lot more of them. Doesn't the JVC have a larger sensor than the Sony. The Sony has a 1 inch whereas the JVC has a 1 & 2/3 inch sensor. Or am I reading this wrong. A few of the you tube reviews Ive seen also refer to the JVC as larger than 1 inch. Please can you confirm as I'm looking to buy one of these and that will be the decider. Hi Perry, the JVC GY-HM170's sensor is a little smaller than 1/2" diagonally, at 1/2.3" or 0.435 inches. Since the AX100's 1" sensor is larger, it would be the better choice if you need shallower depth of field. Hope this is helpful and good luck with your decision! But don't forget, Sony's lens max aperture is f2.8, JVC starts from f1.2! The HM170 has also a BSI (backside illuminated) sensor, that means each photodiode's surface is fully meets light, not the half nor third, like on non-BSI sensors, where the wiring of the diodes covers the light.